In today's promise, Jesus is telling a story about sheep and goats where the sheep (those who are in Christ) will be welcomed into the everlasting kingdom of our God and Father on that great day. 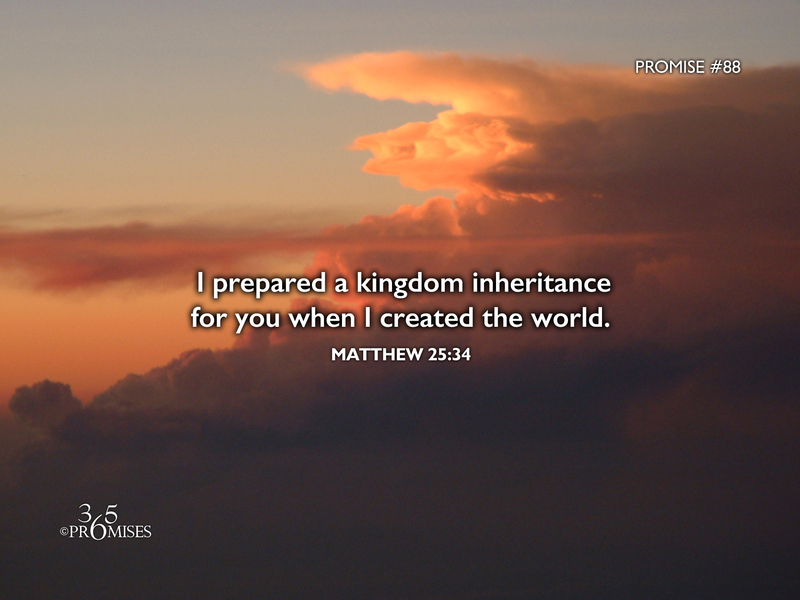 Jesus tells us that the kingdom that we will inherit was prepared for us from the foundation of the world. You and I may not have a substantial inheritance on this side of heaven from our earthly parents, but when we finish our race and are welcomed into the dwelling place of our God and Father, we will have an everlasting kingdom inheritance waiting for us. May the reality of this promise encourage each one of us today. We are not poor in the sight of the living God, but are richer than any one of us could possibly imagine. Because we are sons and daughters to our Heavenly Dad... because we are joint-heirs with Jesus (our Elder Brother) ... because we are the temple of the Holy Spirit... we have an everlasting kingdom inheritance waiting for us. Hallelujah!!! !